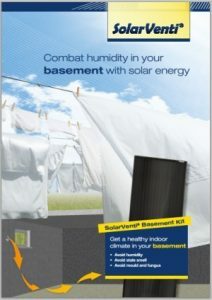 SolarVenti Solar Air collectors improves Moist Basements - by dehumidifying. Is your basement cold, damp, humid & musty? One of the main areas that homeowners experience the need for drying is in their basements. The indoor climate of the basement is prone to experiencing greater coldness, dampness, humidity and mustiness than the rest of the home. The air is typically too static and both humidity and moisture content in walls and other building structure is too high. When the SolarVenti solar air collector is mounted, the basement’s indoor air quality will significantly be improved within a few weeks and the homeowner will begin to experience the basement air as much fresher and less humid to breathe. If the structures are concrete, brick or stone -high thermal absorbency, then that room will also hold the supplementary heat for longer comfort levels. In Australia nearly all year round, and every time the sun shines, the solar air collector will blow free, warm and dry air into the basement. Creating positive air pressure, the air pushes the tucked away, moist air out through the basement vents. After a full season with a solar air collector of the right size, both indoor air and the moisture level in the basement’s solid materials – walls, other building structure furniture etc. – have fallen significantly. With that structures and air will be at a more ‘comfortable’ level. Fresh air is sucked in through the solar air collectors perforated backplate. The air circulates in the collector and is heated by the sun via the special black filter. With the twin fan system, the sun shines on the panel, then supply fan and exhaust system start working. SolarVenti blows about 100-200 m³ fresh and dry air into the basement of an hour. The preheated air injected can be about 15-40° C warmer than the outside temperature. The exhaust fan removes the damp and stale air by sucking it out of the basement – in this way you avoid the clammy air flowing up into the rest of the house. 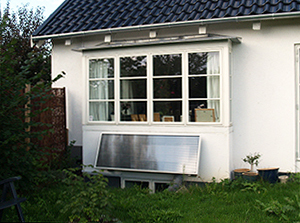 SolarVenti solar air collector uses solar energy and air via the fan units to dehumidify the basement. Through a combination of heating (blowing hot air) and positive ventilation (intake and extraction of moist air) pulls the content moisture out of the masonry and other materials, then carries the moist air out of the basement. A Ventilation Kit together with the sun collector is highly recommended with the solar air collector chosen. When a basement is to be dehumidified with a solar air collector or solar air heater, consistent air exchange is extremely necessary. The moisture that often hangs in the air causing the familiar musty basement odor, must be replaced with nice, fresh air. Solar air collectors from SolarVenti are known for their large air volume and therefore particularly suitable for dehumidification of basements or similar cellar areas. After the first hour of operation heating is increasingly important. The high air supply temperatures will now lead to an evaporation from building materials, structure and furniture. A high air exchange is still required and ensures that the evaporated moisture is carried out of the building. It is extremely important to dimension the size of the exhaust ventilator (Ventilation Kit) to the solar air collectors -air supply capacity. With an undersized exhaust ventilator, you run the risk that moisture condenses before getting out of the basement. An air change rate of once per hour is recommended. While the collector is quiet at night, the dehumidification process continues through thermal balance and equilibrium moisture content (EMC). The dry basement air will now absorb the moisture from the walls and furniture. When dehumidifying begins again after sunrise when the solar air collector runs, the ventilating ‘Phase I’ is initiated again. Free ventilation with warm, dry air throughout the year with the SolarVenti air collector makes holiday homes nice to be in – and nice to come to when the season starts. Without any operating or environmental costs. The SolarVenti solar air collector’s patented construction can solve the vacations homes indoor climate problems and saving on heating bills at the same time. SolarVenti solar air collector is solar powered – it runs without burdening the user’s money purse while delivering a positive contribution to the planet’s CO2-accounting. All year round, without maintenance and whenever the sun shines just a little bit, the solar air collector sends free, warm and dry air into the building. And pushing stale moist air out. A SV30 air collector blows 100 to 150m3 of air in per hour when the sun shines. The preheated ventilation air is blown into the house with a temperature increase of up to 40° degrees compared to the outdoor air. A HEALTHY basement, a COOL basement in Summer, a WARM basement in Winter, a DRY basement all year round, a GREEN basement and SAVINGS on your electricity bill. What more could you want from your SolarVenti Ventilation System!